This article is 3198 days old. Over the next two weeks, we’ll be profiling Windsor’s public, federally and provincially funded Infrastructure Stimulus Projects. It’s mid-season for the projects, all of which must be completed by March 2011. The Windsor Riverfront Retention Treatment Basin is a massive project to construct an underground tank which will hold and treat water. The basin is designed to take in huge volumes of water during significant storms which would otherwise have difficulty making it all the way to a regular water treatment plant. Since most of the water comes from Windsor’s older combined sewers (think: storm sewers that are grates on roads, and sanitary sewers that are connected to your toilet), the water needs to be treated in the basin before it is released. 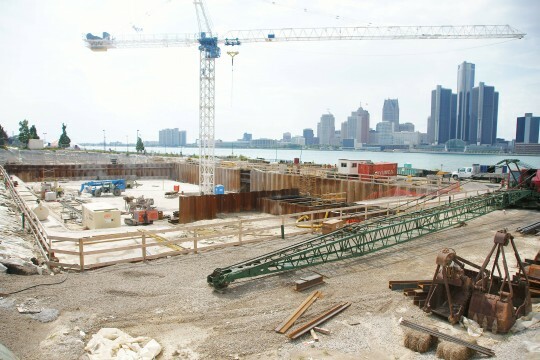 The basin is being constructed by Spaans Babcock, PCR and Golder & Associates with consulting provided by Stantec.